Insert an Hitachi AVC080 Audio Video Center between the AVR and the HDTV. The Hitachi will digitize and upscale the video signal to 1080i or p. The Sony BR and the Toshiba HD-DVD players will feed their HDMI signals into the Hitachi center. The, the, the, that's all folks. I have recently replaced the STR-DE935 with a Sony DA2ES receiver. I bought it used off E-bay. The seller stated that the DA2ES had been used in a second home and has very low hours of usage. Based on how clean the amp is, I believe him. Does anyone else have a DA2ES and what is your impression of it. That's a rather old model, no HDMI correct? May I ask why not go with a receiver so that the audio can be decoded on the receiver side? It just seems you don't have the "typical" set up. I am not sure of the purpose of the Hitachi between the AVR and the TV? Or am I missing something? Yes, the DA2ES has no HDMI which is fine by me. You see, most of my video sources ouput composite video which is analog. 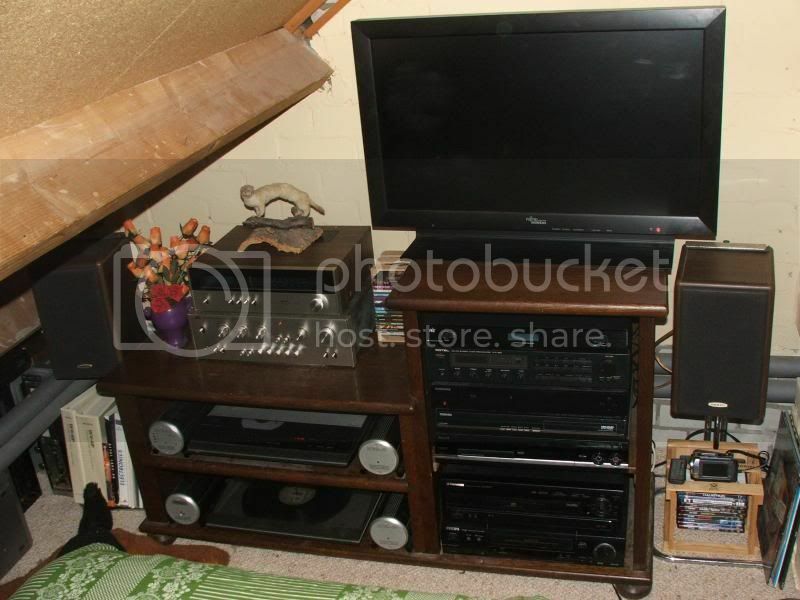 Video sources include DirectTV receiver, Pioneer Laserdisc player, CED videodisc player, and a 200 disc DVD player. The Hitachi can take the composite video output of the AVR and upscale and digitize it so that an HDTV can work with the video using HDMI. Some HDTV's do not work well with analog video (i.e. composite) and the Hitachi will prevent video problems on the HDTV. The AVR will do the DTS and Dolby audio decoding. The Hitachi has 3 HDMI inputs and 1 HDMI output which will go to the HDTV. One HDMI input on the HItachi will be for my Bluray player and the other HDMI input will be for my HD-DVD player. The Hitachi also has 2 composite inputs and 2 component inputs. I will be using one of the composite inputs to accept the output of the DA2ES. The DA2ES will be doing the composite video switching for me. The DA2ES is an older AVR which still has control-s outputs. (Sony, in their infinite wisdom, has discontinued the control-s on their more modern equipment) The control-s works well for me as I have some equipment in a closet about 18 feet from the AVR. I have run wiring from the AVR to the closet. The control-s eliminates the need for an IR repeater. 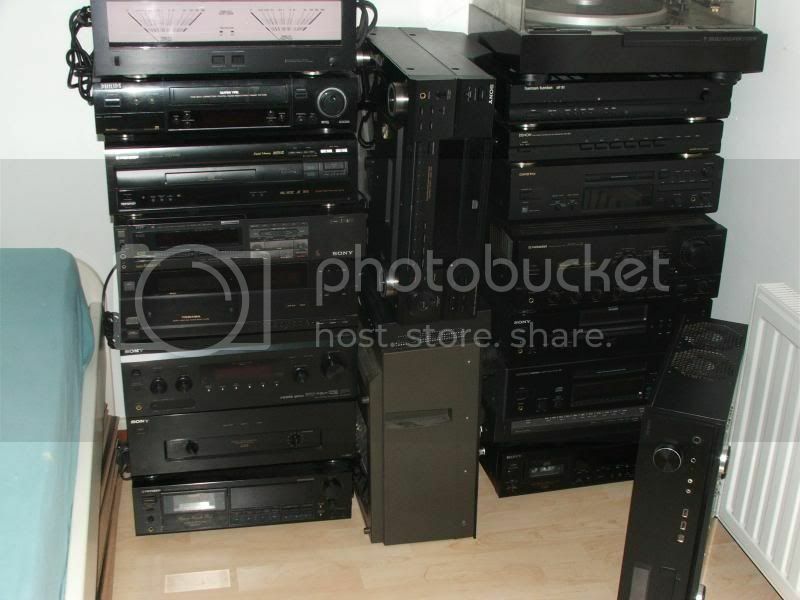 The equipment is a Sony 200 disc DVD changer, a Sony VCR and a Sony Laserdisc player which have control-s input jacks. Because of the control-s, I can aim my remote control (say for the DVD changer) at the AVR and the IR commands will go over the control-s cabling to the changer in the closet and operate it. 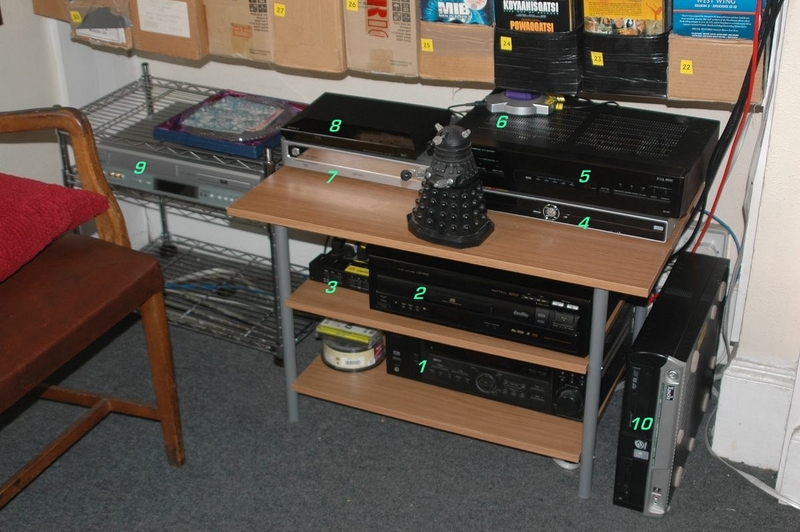 Or, I can turn on the 200 disc DVD changer and my AVR will detect it and switch itself to the DVD input or I can hit the power button on the DVD remote and the changer will turn on and the AVR will switch its input to the DVD. I hope I have explained this clearly. In my situation, a more modern AVR would actually be of less use to me than an older AVR. I would need to install an IR repeater and IR emiiters on my equipment which would be messy IMHO. All is clear. Just the hitachi part? Why hitachi? Its not a very well known or popular video processor. Does it have some magic we dont know about? Well, I don't know if it has any "magic". I bought the Hitachi from a guy who was selling them off the CED forum (I think it was rixrex). He highly recommended it as it solves the problem that some HDTV's have in displaying analog video. The cost was very reasonable (~$80 if I remember correctly). Currently, I don't have an HDTV so the Hitachi sits, gathers dust and waits for the day I can put it to use. Who knows, maybe it will be a gutless wonder and it will be tossed out the window (lol). Time will tell. Go to http://www.cowboom.com/product/581628 for more info. PS: I did not know that the DA2ES was SO OLD. If the copyright date (2002) on the instruction manual is the same for the DA2ES, IT IS OLD. I don't mind if is is that old as it looks like it was just removed from the box. Clean and all functions work which is what I wanted. what model is your TV. I have an Hitatchi L32A404 I got from Walmart that seemed to be discontinued the exact moment they went on sale. or at least that is what it seemed. It was hard to find one. My SDTV is a 27" Sony Wega which displays only 480i/p. I am contemplating a 30" 720p HDTV in the future. Its manufacturer is still up in the air. To quote the box that the Hitachi came in: "This AV Center is intended for use with Hitachi Ultra Thin monitors that include remote controls". In trying to find its age, I could not find a copyright date on the manual. Oh well, I hope it will do what I want it to do. So still no setup pictures. I hope my entertainment room is ready soon! I've made a lot of changes in recent months - most notably replaced my CLD-950 with a CLD-D925, and added an Onkyo AC-3 decoder, a switch box to let me use optical digital from all of the devices that currently support it, since my current amp only has one optical digital input, replaced my old upscaling DVD player with a blu-ray player (which also does web TV things), and replaced the old TV stand which was falling apart. So here's my current setup. It's already apparent that the current table is too small, eventually I want to replace it (and the wire shelves next to it) with something more suitable, possibly a wider set of shelves. 1 - Sony STR DEA475 amp; Surround sound, receiver, etc. 3 - SCART switch - also called Euroconnector, this is a big clunky analogue RGB & sound connector, used by my older kit. 4 - Ellion DVD/HD recorder. The laserdisc player and video and digital receiver feed into this via SCART, with output to the TV. 5 - Onkyo ED-901 AC-3 RF decoder - converts all laserdisc sound outputs to 5.1-channel audio. 8 - Sony BDP-S1100 Blu-Ray player; region hacked for DVDs, and connects to the internet for BBC iPlayer and other online video and audio sources etc. 10 Computer, a fairly basic Linux box that's mostly a backup PC and used occasionally for media files. The speakers etc. haven't changed since my last update. JVC VN-700 amplifier (aboit 40 years old) I'm still in love with it.... It just keeps working! Bang & Olufsen CDX-2 CD player (modified) Beautiful thing! Bang & Olufsen Beogram 3300 turntable (new wiring) also beautiful! Nikko FAM-500 tuner (gefurbished) great tuner and looks great together with the amplifier! Onkyo D-202 speakers (2 way, BR with 16cm woofers) sounds incredible on the JVC amplifier! Together it appears to be a match made in heaven in the sleeping room! upgrade bug has returned. I think I am adding a Lumagen Radiance 2021 to the chain soon. Wait a minute!! Looks like the upcoming lumagen radiance 2141 has 3d comb filter. If it is any good, i might just skip all above and run hldx0 into new radiance. It's fascinating to read about others systems. I am inspired by the small details, and this comes from the unlikeliest of places of what others have shared. I have some changes coming along soon to my own system, and once they are in place I shall share with this site. It may not happen until the end of this year, but other none AV items are currently being purchased, that will finish of my living room. The item to be added with be the last Stand from HiFi Racks that will need to be made to order. Damn, you guys make me feel pitiful in comparison. I never have the $ to really put into my setup, so it's still primarily SD oriented. My speaker stands are wood barstools, and we built my tv stand out of some spare lumber. (works really well actually!) Everything else is sadly on the floor or on a side table, which isn't the neatest but since I have very little space it gets the job done. On my PC I use foobar2000 and listen only to FLAC and lossless audio. On the go I use FLAC on my rockboxed Sansa Clip+. Love all the McIntosh gear! I finally got hold of some strong industrial shelving, which is what I should have done in the first place, so changed my setup again. I have some VERY strong wheels on order for this, but they haven't come yet. * Ellion DVD/HD recorder. The laserdisc player and video and digital receiver feed into this via SCART, with output to the TV. * Sony BDP-S1100 Blu-Ray player; region hacked for DVDs, and connects to the internet for BBC iPlayer and other online video and audio sources etc. A bit difficult to see since it's partially concealed by the shelves. It's on top of an Elonex computer, a fairly basic Linux box. * Onkyo ED-901 AC-3 RF decoder - converts all laserdisc sound outputs to 5.1-channel component audio. * Sony STR DEA475 amp; Surround sound, receiver, etc. I've ditched an optical Toslink switch I previously installed, since it was a pain to use and spent 99% of its time set to laserdisc, and the analogue output from the other things linked to it seems to be as good as the digital. The screen is a Teco 40" LCD - it works but it's about eleven years old, I'll probably replace it with something better sooner or later. Not necessarily bigger, since I only sit about 10ft away (though there are some fairly tempting offers on 50" screens at present) but hopefully higher definition and better brightness / contrast. 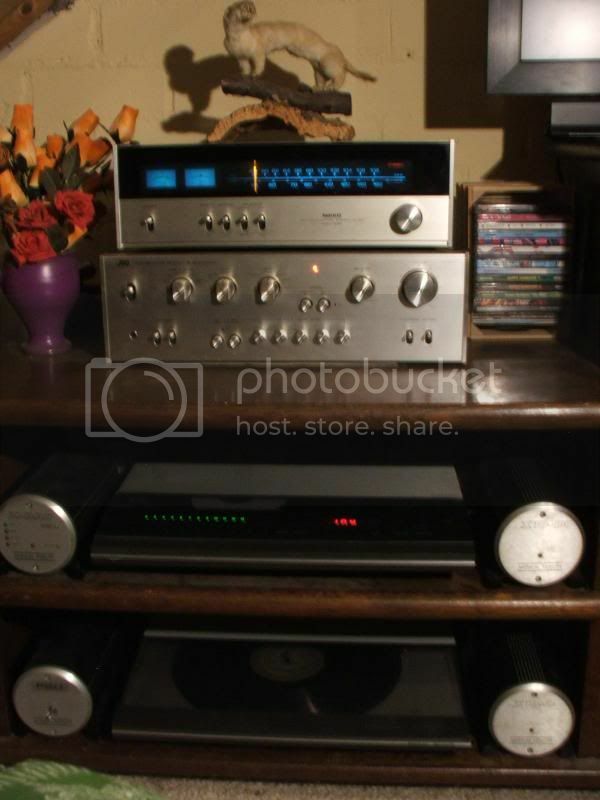 There's an Eltax centre speaker on the floor in front of the fireplace, next to the subwoofer. The other speakers are also Eltax models - the smaller JPW speakers are for my hi-fi, which is a separate system with speakers in several rooms. update - Since posting the above I've moved the digital TV receiver down to on top of the VCR, and put the blu-ray player in its place. This makes a LOT more sense for accessibility - I never need to touch the TV receiver so it might as well be down low, whereas I need to put disks and occasionally plug USB sticks into the blu-ray player, it helps to have it as accessible as possible. Hey there, I have been following this post with quite some interest for a while now, it is safe to say you have an awsome setup there buddy . I am currently running all ex cinema equipment and I will hopefully start putting my home entertainment area together soon. I was part of the installation team when the cinama company I work for changed from 35mm to digital projection so I managed to score plenty of bits and pieces but you would be amazed at the stuff we dumped, not knowing at the time that people may be interested in it, for eg: we dumped 3x sdds processors and heads and numerous cp45 60 and 500 units. I hope to hear from you again soon with some updates on ur awsome setup. I'llbe updating my list soon becauseim picking up some new stuff soon and having my speakers refurbished. TV: Sony Bravia KDL-32L4000, got it on sale and I never plan to give it up, it's input galore. 2 HDMI, 2 Component, 2 Composite, VGA, coaxial, dedicated RCA audio out, S-Video, etc. Sound: TEAC MC-D80 receiver/CD player. Not amazing but it was fairly inexpensive and sounds nice. Paired with a set of Pioneer SP-BS21LR speakers, which I got on closeout for $70 shipped for the pair (NIB). PS3 for Blu-ray, Netflix, and MP4 viewing. I have a Roku 2 HD, but it has major wireless signal issues in my building and I got so tired of dealing with it that it's in a drawer now. DVL-909, displaying on a Bravia KDL-32L4000. Pioneer CLD-S104 for backup.